BIRATNAGAR, Dec 29: Paddy production in Morang has hit a five-year high of 418,200 tons in Fiscal Year 2016/17. According to District Agricultural Development Office, Morang, paddy production in 2016/17 increased by 100,000 tons compared to 2012/13 when the district had produced 318,841 tons. Paddy was planted in 97,860 hectares in 2012/13. Paddy has been planted in 92,300 hectares in 2016/17, according to the office. Though paddy cultivation area has declined by 5,500 hectares compared to 2012/13, production has been satisfying, according to the office. Cultivation area is decreasing with every passing year due to conversion of farmland into residential plots. According to the office, more than 20,000 hectares of farmland has been converted into residential plots in the past five years. Manoj Kumar Yadav, chief of the office, said that paddy used to be cultivated in 112,000 hectares five years ago. “Now, paddy farming is done in only 92,000 hectares,” he added. Despite shrinking cultivation area, paddy production has been increasing. In the last fiscal year, 382,713 tons of paddy was produced in 93,850 hectares. Paddy production in 2016/17 is up by 14 percent compared to 2015/16. According to the office, paddy production grew this year as farmers got fertilizers, inputs and improved seeds in time. 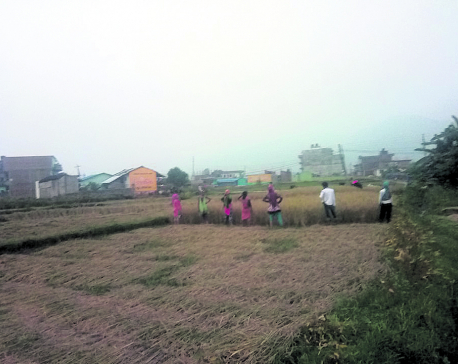 “Sufficient rainfall is the other reason behind significant rise in paddy production,” Yadav said, adding that the number of farmers using System of Rice Intensification (SRI) technology has increased in recent years. According to Yadav, use of SRI technology has helped to increase paddy production. 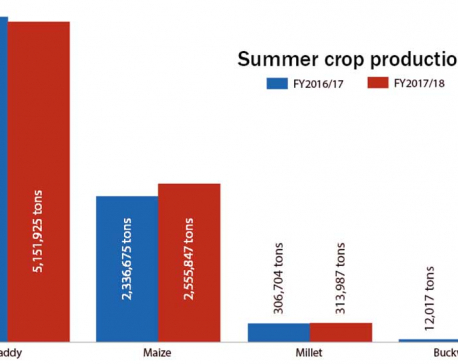 Paddy production in Bardiya has increased in 2016/16 compared to last fiscal year. 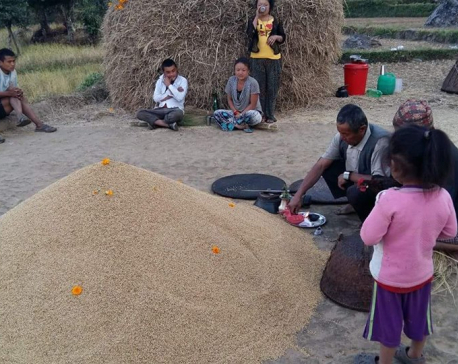 According to District Agriculture Development Office, Bardiya, paddy productivity increased by 4.05 tons per hectare, compared to 3.09 metric tons per hectare in the last fiscal year. Paddy production increased to 202,000 tons in the current fiscal year compared to 195,302 tons in 2015/16, according to the office. Paddy farming was done in 50,000 hectares this year, compared to 50,072 a year earlier.